The correlation between maternal diet, weight and health and the future health of the fetus has been a hot topic in pregnancy research for more than a decade. Recently, researchers from the University of Madrid found a possible connection between maternal diet and risk of diabetes. According to the study published in the European Journal of Clinical Nutrition, a poor pregnancy diet is not healthy for baby. 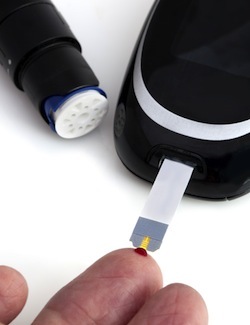 Diabetes is diagnosed with a blood glucose test. Elevated blood glucose, as measured using medical standards, is indicative of the condition. Type 1 diabetes, also known as child-onset, is a condition found in children and extending to adulthood. Type 1 diabetes cannot be prevented or cured. Type 2 diabetes, or adult-onset diabetes, is associated with excessive body weight, poor eating habits and other factors. In many cases, type 2 diabetes can be prevented or cured with proper diet and weight loss. At the heart of this study is the impact of maternal diet on blood glucose levels. When women consume poor diets that increase blood glucose, during pregnancy, baby also experienced elevated blood glucose levels. Subsequently both mother and child also experience increased insulin levels to combat the elevated blood glucose. While this is not new information, researchers also reported fetal pancreatic development may be altered by these effects thus increasing the risk of diabetes for the infant. Further research is needed to determine the true definition of healthy pregnancy diet. The perfect combination of protein, fat and carbohydrate has not been successfully determined. A previous study, for instance, found prenatal diets high in fat (even if the mother was a normal weight) increased the risk of diabetes. If high fat and high carbohydrate diets increase risk, protein may be the defining factor – but additional research is needed. Currently, the definition of a healthy pregnancy diet suggests eating whole grains, high-fiber fruits, lots of green, leafy vegetables and lean protein.